If you are missing teeth, or have damaged teeth that are beyond repair, preserving your oral health is a big concern. Secondary to your original teeth, dental implants are the next best option to restore health and beauty to your smile. Dr. Matthew Ficca, a Charlotte periodontist, is dedicated to creating dental implant treatment plans using high-tech equipment and advanced methods for results that last. 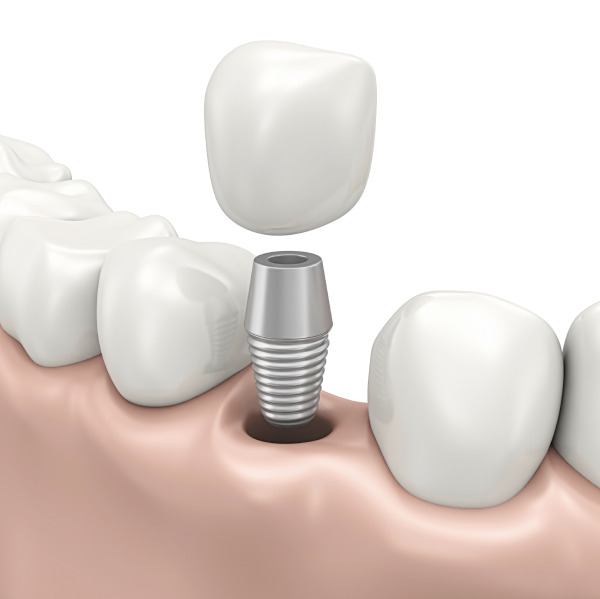 Dental implants consist of a titanium screw, an abutment and the final restoration. The screw is implanted into the jaw bone and mimics the tooth’s roots. An abutment is placed on top of the screw to hold the restoration in place. Depending on how many teeth are missing, Dr. Ficca will restore the tooth with a single crown, a bridge, or denture (partial or full). Metrolina Perio offers the Straumann dental implant system to give patients proven, quality results. In preparation dental implant treatment, Dr. Ficca may need to perform procedures to ensure the implant is optimally placed i and provides maximize durability and longevity. Using a CT scan, Dr. Ficca is able to determine if a bone graft or sinus lift must occur before placing the implant. Using computer-guided implant surgery, Dr. Ficca determines the best placement to give patients their desired results. A customized healing abutment is placed, so patients can leave with a temporary crown in place. For your convenience, Dr. Ficca can remove a damaged tooth and place the implant the same day. Teeth-in-a-day/same-say-smile treatment with Straumann implant systems gives patients the opportunity to walk out of out of our Charlotte dental office with a beautifully restored smile. Once the implant has fused to the bone, though a process called osseointegration (2-3 months), your final restoration will be placed. Your new smile will comfortable, give you confidence and improve smile aesthetics and oral function. Metrolina Perio provides comprehensive care for patients even after their initial procedures are complete. As a courtesy, dental implant recipients are contacted by a staff member about six months after their treatment to ensure they are satisfied with their results. Maximize treatment success rate and minimize return visits and restoration costs. If you are looking for an affordable solution to missing teeth, please contact Dr. Ficca to find out more about your implant dentistry options. Patient education plays a large role in Dr. Ficca’s treatment plans – we help you discover what treatment for missing teeth works best for your situation. Schedule an appointment today.